Ginger is one of my favorite herbs. 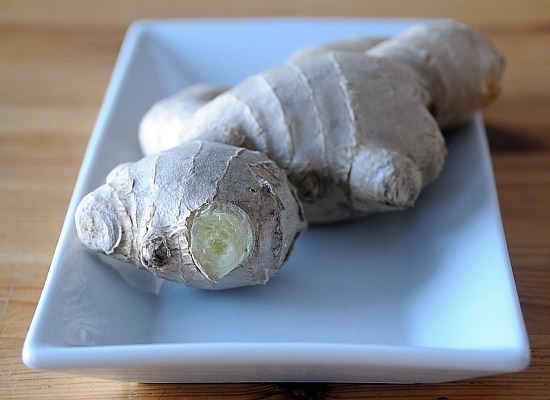 I adore the assertive flavor of ginger, but it’s also very good for you: ginger is reputed to remedy digestive issues including stomach upset and nausea. 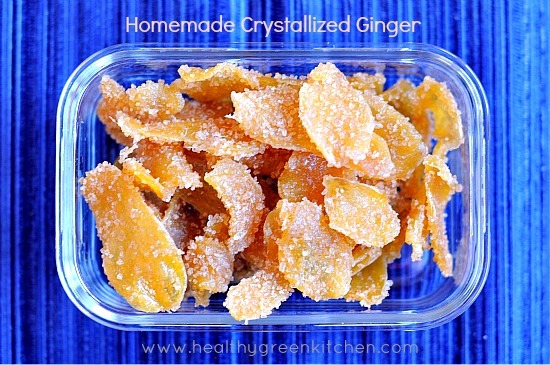 I enjoy using fresh ginger in my cooking and I like snacking on and adding crystallized (aka “candied”) ginger to all sorts of recipes, as well. Crystallized ginger is one of those things I’ve wondered about making pretty much every time I’ve placed some in my shopping cart. Years of wondering, people. Years. Turns out it’s a lot easier to make than I imagined it would be. …but you can easily double the amounts of everything. I cut the ginger with a mandoline slicer - mandolines are great for ensuring slices with uniform thickness- but if you don’t have one, a very sharp knife can be used instead. 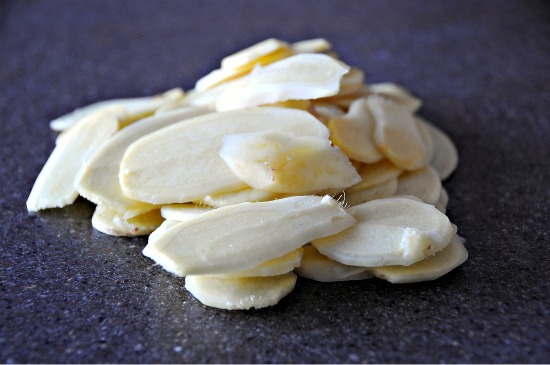 If you do have a mandoline, always use care when slicing because the blades are VERY sharp. Make sure not to discard the syrup when you strain the ginger slices: it’s great mixed into seltzer and tea, and I imagine it’s fantastic over yogurt (or vanilla ice cream), too. Slices of purchased candied ginger are usually completely covered with sugar: I used a fairly light hand when I sprinkled mine, and I chose demerara sugar for the final toss because I love the color, size, and taste of the crystals. The type of sugar and the amount you use for the last step is up to you. Use less if you want your candied ginger to retain a spicy bite, and more if you like your candied ginger to be quite sweet. Great job! I’ve always loved the candied ginger I’ve gotten from Trader Joes but never even bought fresh ginger. I hear they have chocolate covered ginger. Definitely need to try that. Ooh…. another thing on my to-make list; thanks for the reminder! So what’s your favorite application for them?! this is so useful when you have a throat infection too…. though i love finely shredded candied ginger over plain vanilla ice cream too. Oh I LOVE this idea! It would make a lovely homemade gift, too…soothing and tasty, wrapped in a pretty container. Great idea! Great job with the candied ginger and thanks for posting this! Will definitely try soon! I have been wondering about home made crystalized ginger. Ginger is one of my favorite herbs too. Thanks for sharing! I saved this to my cookbook online immediately (cookmarked.com). I have some extra ginger on hand right now and am heading to the kitchen to make this! Thanks for sharing. I never thought of making my own. Thanks for this post! This is definitely easier than I expected. I would use it more if I made it myself! OOh so pretty and simple to make! Thanks for sharing. I use this often, especially in muffins! I didn’t realize how easy it would be to make! This is really simple yet healthy recipe for keeps. Lovely to have dropped here. Beautiful space. This is so much easier than I thought it would be! Don’t you just adore crystallized ginger? So good…especially in baked goods. Thank you for sharing this yummy idea with me. I hope you have a wonderful New Years with your family and friends! This is something I would have never even thought of making! I love being able to do “make your own” things that one would normally purchase from the grocery. This is a great example of a make at home item and one that I’ll be using often. Great job, Winnie. What a wonderful idea!! I’ll bet these are SO much better than the ones you get in the store… I will definitely try this! I’m so happy I found this recipe, I am a huge ginger lover! 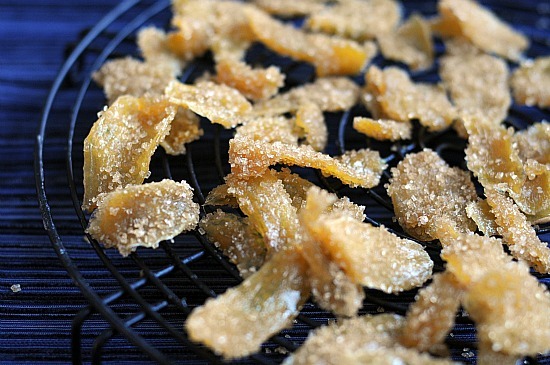 I’ve never thought to try and make my own candied ginger at home before, but it looks pretty easy I’m curious to try it out. Thank you! I’ve become addicted to snacking on crystallized ginger, and I’ve wondered if I could make my own. Question: do you peel the ginger before you slice it? I love crystallized ginger and use it for so many things, including just plain eating it out of the bag, adding it to my homemade apple pie and some of my quick breads. Making it yourself (thank you for the recipe – it looks easy as can be) is obviously more cost effective AND if you need to be gluten free, it lets you control the circumstances so that you can be assured that it’s made in a gluten free environment. Thank you! Thank you so much for sharing this recipe! I don’t think I’ll be buying my crystallized ginger from the little bag at the grocery store anymore! This is just what I was looking for (on google) as I sit here with my giant bag of ginger! This may appear on my blog and in my shop before too long. Great idea! I’ve grown my own ginger before, but never thought to candy it. And I love munching on candied ginger, though I have to say I’ve never used candied ginger in a recipe. Thank you so much for posting this. I have just moved to an area where I cannot get the spices and things I am used to getting and one thing I am missing is having crystalized ginger to snack on and use in recipes. I knew it had to be easy but I did not know how easy!!! Thank you! Thank you! Thank you!!!!! Making my own ginger syrup when I emptied my store brought jar. Why not try using Coconut Sugar instead? It’s less toxic then Cain sugar and far less people are allergic to Coconut sugar! Our society is to dependent on Cain Sugar and as a result our bodies are struggling from sever allergies and even disease from over consuming it! Love the recipe, have been eating crystalized ginger for my arthritic joints after reading tip in Daily Telegraph. It seems to work but can’t guarantee, worth trying and so delicious. Great with breakfast cereal too. I needed ginger so I bought some at the grocery store today. I bought a LOT and then when I got home I asked myself what in the world I was going to do with it all. Thanks for this recipe. I’m sure I’ll love the finished product.